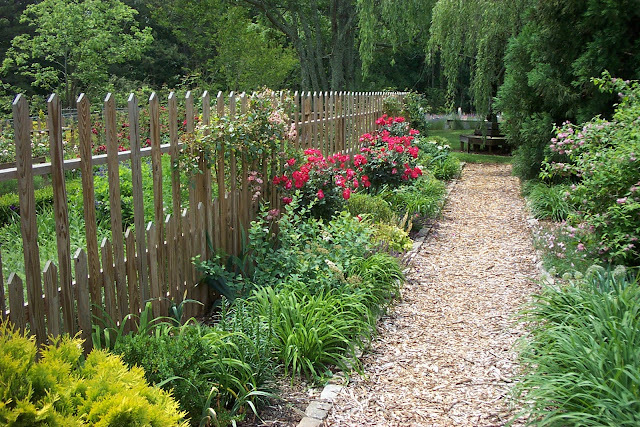 The secret to this amazing garden a few miles south of my hometown of Palmetto, Ga., is composted leaves (and a lot of hard work over the years). When I was growing up, I passed this house innumerable times on the way to Newnan (that's where we went to the doctor, dentist, etc.). It was a derelict plantation house that sat up on crumbling stone pillars. Rusted car parts and farm implements poked up from tall weeds and scrub pines. The early 19th century house looked as if it would topple over at any moment. One day, a dynamo named Liz Tedder came along and bought the place. Before we knew it, the house was on a solid foundation and restored beautifully. Gardens began sprouting in every direction. What was once the Arnold homeplace is now the Tedder miracle. Already a knowledgeable and experienced gardener when she and her husband George bought the property, Liz has created all sorts of gardens that produce loads of flowers, fruits, vegetables and herbs each year. Her secret? Leaves that people put by the curb in fall. The Tedders pick them up and bring them to the garden, grind them up and spread them on the ground. The eventual result is deep, rich dark soil that is several feet deep. You could plant something with your bare hand and dig a hole down to your elbow with no trouble. George Tedder provided me with this photograph of just one of the lovely paths in back of the house. In August, I'll put up a picture of her scuppernong arbor. I am really jealous.